For the zombie enthusiast, it doesn’t take long to scrape the bottom of the zombie-themed entertainment barrel. There just aren’t that many really good movies, stories, blogs, and other web content out there. Before you know it you’re watching Day of the Dead 2: Contagium and wishing the real Zompocalypse would start. 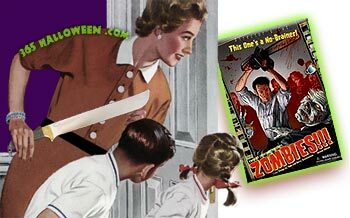 So what does a zombie fan worth his machete do when craving some fresh, heart-pounding, survivalist action? 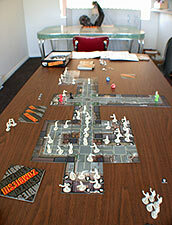 Assemble a core team and hunker down for a game of Zombies!!! You’ve probably asked yourself at least once: what would I do if the world was being overrun with flesh hungry corpses? Here’s your chance to find out, as you and your opponents try to escape the multiplying horde of the undead, get to the whirlybird, and fly off into the sunset. Zombies!!! is a hybrid CCG and board game that requires strategy, a strong stomach, and a strong survival instinct. Using a modual set of board game “map tiles” the layout of your town is different every time, creating endless variations. 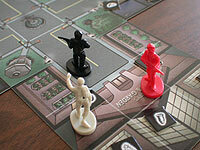 You and your fellow humans start out in Town Square, adding tiles and expanding your playing field at the beginning of each turn. Some of these tiles contain uneventful buildings, while others are fodder for the gorgeously illustrated “event cards”. For instance, at the Sporting Goods Store you can use the Lots of Ammo card to pick up a good amount of weaponry. That’s been a lifesaver more than a few times for us, and the image is probably the most gory in the pack. In the Gas Station you chuck a Molotov Cocktail and get better fighting skills for a short time. Other highly useful cards include; finding a car and discovering that The Keys Are Still In It, wielding a Chainsaw for an entire turn, and maybe the funnest discovery of all: Hey Look… A Shotgun!. The artwork on these cards, done by Dave Aikins, is amazing, and is worth the $25 price all by itself. Our first couple games were particularly long since all the players were distracted with examining the artwork. The ever-changing board layout also sets the stage for a variant ending. Sometimes it’s impossible to lay down all the tiles and so rather than heading to the chopper, the winner is declared after killing 25 zombies. With 100 of the little grey guys included (which some people have custom painted), it’s a fun yet formidable goal. 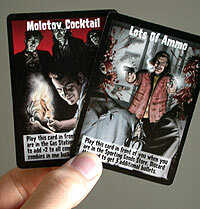 You can also opt for variant sets of rules and/or a customized card decks to create an entirely new scenario. The customization options are really endless and so many good ideas have all ready been submitted by players. For us, that’s one of the strongest features, as it means our Zompocalypse won’t veer into predictable territory and could feasibly go on forever. We tested the first edition of the game (there are many expansion packs which include new cards and tiles) and another annoying factor is the amount of devious cards: too many of them can negatively affect everyone on the board. Each player’s turn adds new zombies to the town, but many event cards “allow” you to add 5, 10, or a whole bunch of extra zombies into the mix. Not that being devious isn’t a necessary evil for this game, it’s just that too many cards are used for this purpose. When you’re running low on life and bullets (which can be a very frequent occurrence), the last thing you want is to draw card after card that would further infest your city with zombies, even if that might also slow down your opponents. As cited in another review, “The strategy of the game is hidden when you first try to play. Basically, you want to hinder all of the other players from doing well, while you hold onto as many bullets and life points at the same time”. These cards are indeed useful in thwarting the other players: there are just too many of them. Another nitpick is obvious to us because 2 of our players are female. 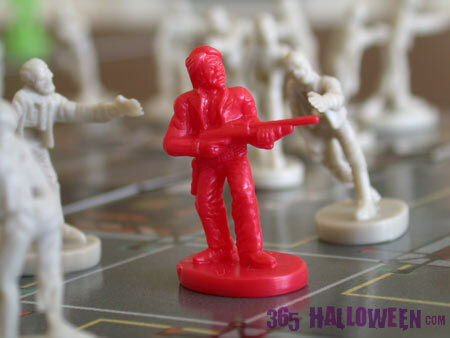 As we went to select our game pieces we noticed only a “shotgun guy“. No big surprise, especially since horror gamers are generally male, but the action cards are decidedly male-dominated, too. Of the 50 event cards, women only appear in 6 of them and none of them include any battle. In fact, they are either cowering, experiencing Claustrophobia or a Bad Sense of Direction. It smacks of wimpy 1968 Barbara instead of adaptive, shotgun-wielding 1990 Barbara from Night of the Living Dead. Hopefully future editions will have a wider range of characters featured in the artwork and playing pieces. 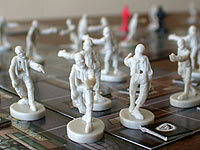 Players on Board Game Geek are pretty divided on Zombies!! !, but we give it 4 out of 5 brains. The variety makes it a new experience every time, and besides the game mechanics, the theme is spot on; the action cards explore so many ideas that movies have yet to depict. For zombie fans, it just doesn’t get any better. 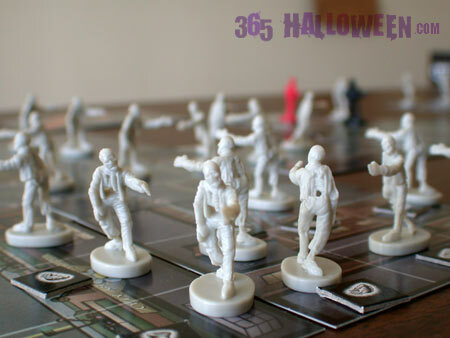 Grab yourself some snacks, pop in some Romero, and try your hand at surviving the Zompocalypse. Buy Online At: Twilight Creations or find a killer deal at eBay. Subscribe to comments with RSS or TrackBack to 'Zombies!!! Board Game Review'. This game can be used to cross geeky borders, too. For example; I am a big Magic; The Gathering geek, and ever since I got the base set, I’ve been hunting for cards that put zombie tokens into play en masse. Because now, I have the mass, especially since I bought a “bag o’ zombies” to go with whatever. (I think I just got it ’cause it was a “bag o’ zombies.”) That’s right, my fellow Magic nerds; Zombies are now *more* cooler. Lastly, as for the game itself, the basic rules are so simplistic that they practically scream for homebrew variations. I’ve been working on a chaos for Zombies!!! called “Scream Queen.” Basically, every turn the SQ has some random effect happen (i.e. screams for no reason, trips for no reason, takes her high heels off, pulls a shotgun out of nowhere and blasts every nearby zombie, remembers she was holding the ammo, etc.) And at the beginning of every player rotation, the role of SQ is randomly assigned to a different player. Overall, this is a must-have little novelty, and I highly recommend it. 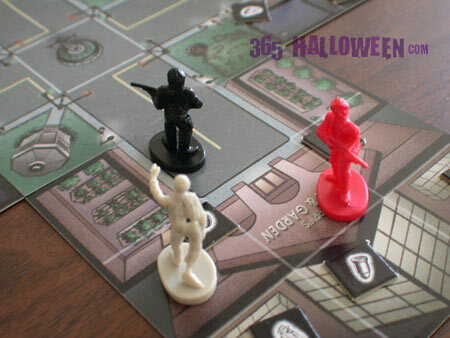 Nothing says happy Halloween like a rousing game of zombies over some bleedy cake. 356 Halloween Response: That’s brilliant, Stephen! The ability to make your own variants is a big appeal for Zombies!!! (and obviously, many other CCGs, RPGs, etc.) and it’s good to know that it can even help “zombify” games like Magic. Because honestly, what isn’t improved with the addition of the undead? Thanks again for your input; send us some action photos if you get a chance! The Zombies!!! Board Game is an awesome way to have some fun. It’s always changing and it is never the same. I love creating chaos for other players! It is not a game for the kind hearted! You have to be malicious and think about yourself and yourself alone. This game rocks! Try the expansions (2, 3, 5,6). Also, try the 3.5 event card expansion (if you can find it); it adds a new twist and more fun to the game. Zombies!!! gets my vote for excellent and fun. I own parts of this game (me and a friend own various expansions etc.) and I can say that it is easily my favorite board game. It is never the same experience when we play, and I love how flexible the rules are, and how we can change them to suit logic. It’s a reeeeally good buy, I promise you this.